6.1 Band saw vs table saw, what do you actually need? 7.1 What should be the size of the tool? 7.3 Is the guidepost adjustable? 8 What is a band saw ? 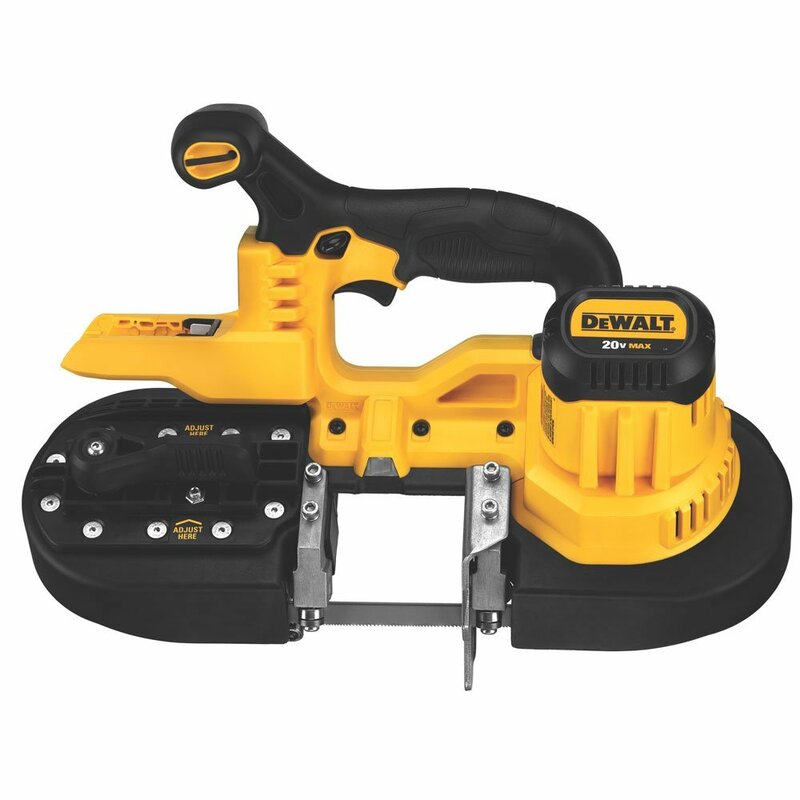 Read the reviews below of the most wanted band saws. When learning how to choose a good bandsaw there are many important questions to take into consideration. Will you be primarily cutting metal or wood? Do you need the flexibility of a wireless unit? How thick do you need to cut? These are just a few important points that can influence your final decision. Jump to the best band saw on Amazon. 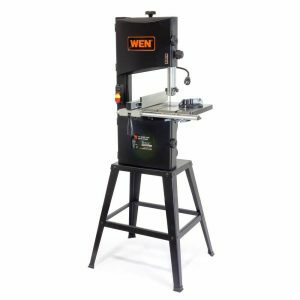 The WEN 3962 Two-Speed Band Saw with Stand and Worklight incorporates a number of attractive options that increase its overall usability. A 3.5 amp motor produces up to 2620 FPM giving you the power you need to tackle tough jobs. The 72″ blade can go down to 1/8 in size and the worktable size has been increased to give you more workspace. This unit operates smoother than most of the competition. The dual 10″-wheels are ball bearing balanced to reduce vibrations and increase accuracy. An innovative 3-in-1 dust port gives you added flexibility when attaching dust collection hoses. 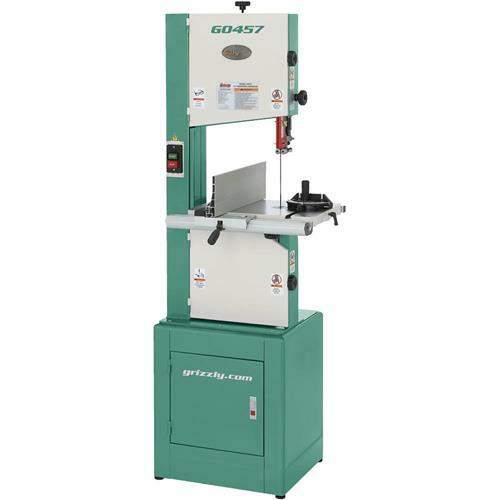 This unit provides unmatched saw capacity; it is able to cut pieces of wood up to 6″ thick. The LED work light adds to the visibility of your cutting surfaces. The craftsmanship of this product is high and the durability is solid. A 2-year manufacturer’s warranty is included with the purchase of this unit. This is one of the best for small shop use available today. 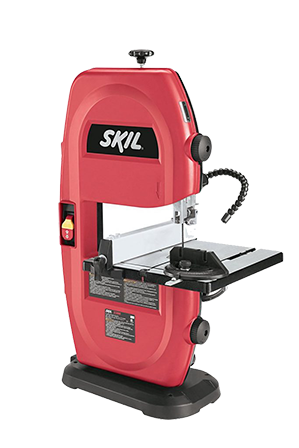 The SKIL 3386-01 2.5-Amp 9-Inch Band Saw features a rack and pinion table adjustment for quick angle and height corrections. The one-speed motor is easy to operate and runs smoothly. A 1 1/2″ dust port gives you the option to attach a dust collection hose to reduce sawdust. The LED cut line light makes woodworking in low light easier than ever. This unit is specially designed for cutting irregular shapes and ripping lumber into thinner pieces. The 6-TPI blade can cut through a variety of woods and metals with ease. The miter gauge makes crosscuts more accurate. SKIL is known for producing quality tools and this product is no exception. A 3-year manufacturer’s warranty comes included with your band saw. 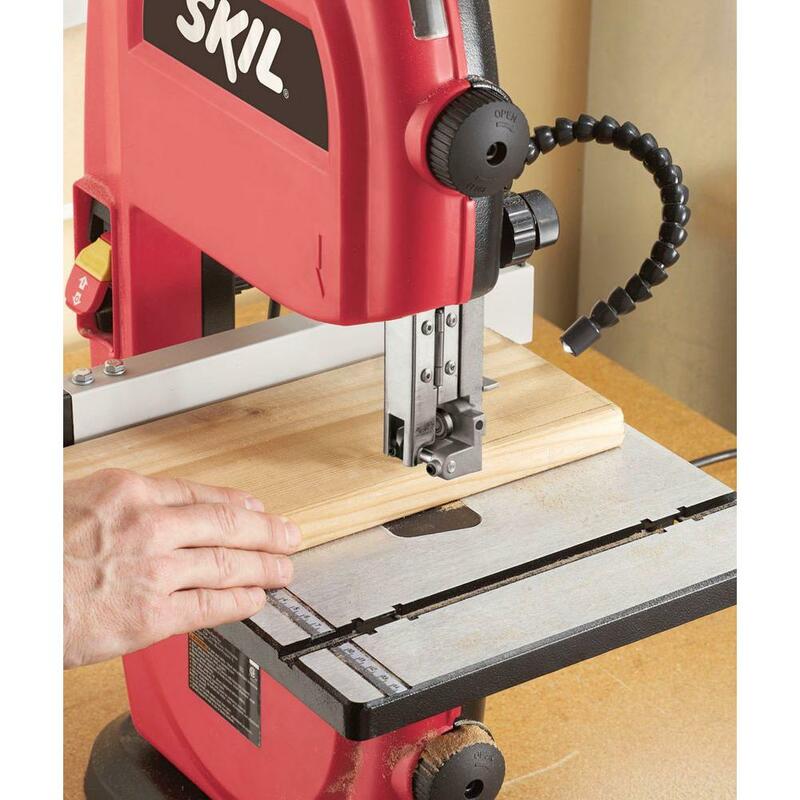 This device uses a 120-volt 2.5-amp motor to make your cuts smoother and more exact. The added power makes a big difference in performance. This product is designed to reduce your workload while increasing your productivity. The DEWALT DCS371B 20V MAX Lithium-Ion Band Saw uses innovative Blade Tracking technology to improve the accuracy of your cuts. This unit can cut up to 2-1/2″ thick pieces of wood and 2″ of SCH 20 pipe. The center balanced padded handle provides better ergonomics and comfort. The lithium-ion battery charges quickly and can handle hours of heavy use. A tool-less blade change lever reduces blade exchange times by allowing you to loosen the blades by hand. Only quality materials were used in the construction of this product. 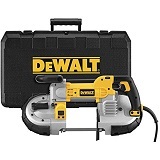 Dewalt stands behind the craftsmanship of this device with a 3-year manufacturer’s warranty. This unit has a weight of 10.2 pounds and dimensions of 8.7″ x 12.2″ x 15.38″, so it very portable.This unit should be considered because of the plethora of features provided. The Milwaukee 2429-21XC M12 Band Saw Kit combines form with functionality. The ultra-portable design gives you added flexibility when working on your projects. 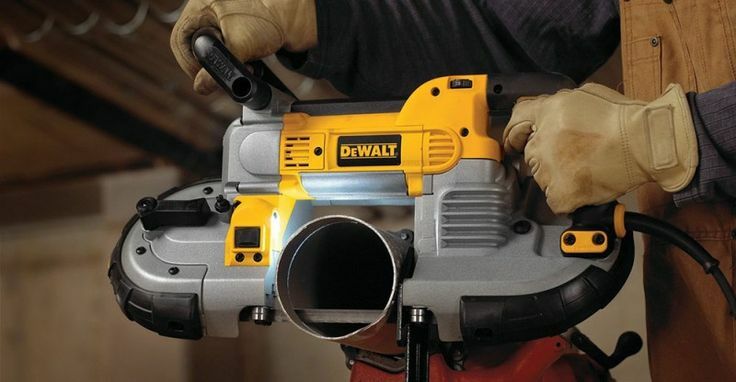 This saw is designed to cut through conduit and pipe, with a max cut capacity of 2″. This unit comes with a hard plastic carry case that holds two 12-volt batteries, a charger, and extra blades. The adjustable shoe feature helps you to make exact changes with ease. The LED guide light automatically turns on during use; to give you increased visibility of your cutting surface. After you see how easy this unit cuts through pipes, you will never want to use a hacksaw again. This product weighs 12.4 pounds and its dimensions are 11.6″ x 16.8″ x 6.5″. The lithium ion batteries are rechargeable and can be exchanged with red lithium batteries, increasing your operating time significantly. A 5-year manufacturer’s warranty adds to the overall appeal of this product. The DEWALT DWM120K 10 Amp 5-Inch Deep Cut Portable Band Saw Kit gives you access to everything you need to start cutting today. The 5″ deep cut capacity is the best in the industry. An easy to use speed adjustment knob allows you to vary your blade speed, depending on your job. The quick charge 10-amp motor provides you with extended cutting times. An integrated hang hook allows you to hang this saw and avoid any damage from laying it on the ground. A built-in LED light gives you better visibility in low light scenarios. 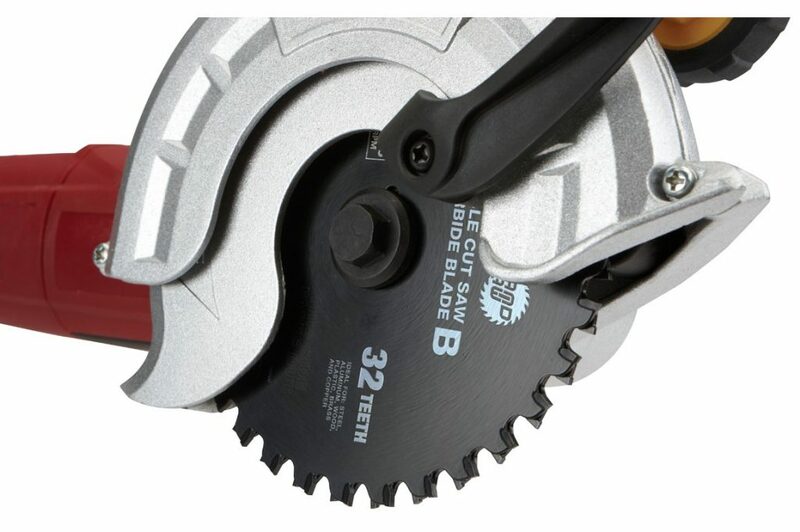 This saw can perform at speeds up to 350 SFM . Rubber bumpers absorb any unexpected shocks you may encounter in the workspace. The ergonomic design provides lasting comfort during extended use. This unit weighs 15 pounds and its dimensions are 14.2″ x 23.5″ x 7.9″. This design adds portability to this unit. A 3-year manufacturer’s warranty is included with this device, so you can work with confidence. This is one of the best for home or small shop use. The price point is excellent and the quality is unmatched. Choosing the best 14 inch band saw can be hard. After reading the band saw reviews it may not be the first tool necessary for a successful wood shop, it may be the most resourceful. Best used to cut curves, a band saw can be guided on thick lumber to crosscut short pieces, create cabriole legs, or to rip lumber. In addition, it can also create some of the smoothest cuts of any tool, which can even include metals if appropriate blades are being used. Essentially, a band saw is made up of wheels—usually three—with a thin rotating blade and a table to support the item being worked on as well as the motor. 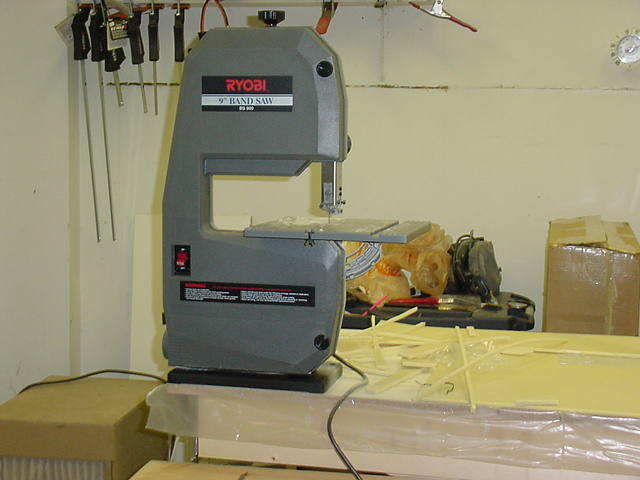 Band saws are generally available in a variety of sizes, which can range from small bench-top (mountable for small shops) to massive floor models (stand-alone). Overall, band saw size and stock size are determined from different dynamics, such as the distance between the inner portion of the blade and the neck of the saw. 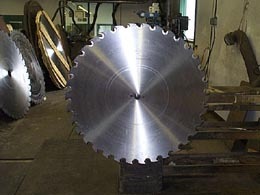 With the 14 inch band saw, for example, 14 inches is the distance between the two proportions. The measurements range from 10 to 24 inches in most cases. The next dimension involved would be the depth of the cut. In this case, depth refers to the table and the underside of the blade’s guard. With this in mind, if you had a saw with a 6-inch cut, which means you can actually cut about 5 – 7/8 of an inch because some additional clearance will be needed. In addition to the saw’s specific dimensions, another important aspect would be the size of the actual table. With larger tables, it’s easier to guide and hold the wood or material you wish to cut. In addition to size, the table should also provide the ability to cut a 45-degree angle, which changes what size may be necessary for the project. 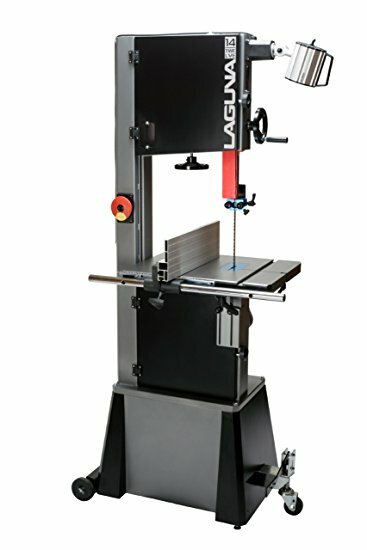 Despite it’s irregular look, the Laguna Tools MBAND 1412-175 14 x 12 Band Saw is a crowd-pleaser due to it’s stacked list of amazing features. The gray and black design give somewhat of a space-age look to the device, making it stand out within any workstation. In addition to the appearance, the Laguna band saw has a 13/4 horsepower motor that powers up to a TEFC of 60 Hz. Also, the voltage includes a fierce 115V with the Amperage of being an impressive 14/7 in height. 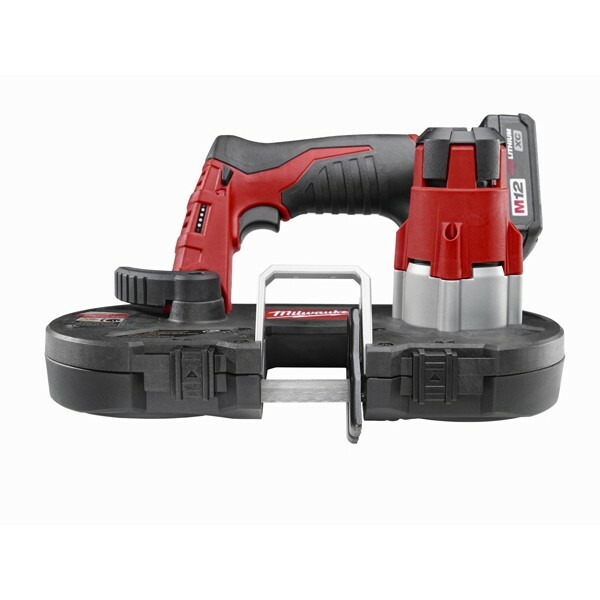 Along with the notable achievements of the tool, a 6-foot cord with a Nema 5-15 plug invites users to use the device further from the power source than most other band saws. 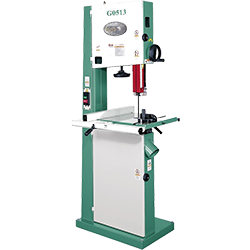 This band saw is also CSA certified and includes a one-touch power switch within the safety key, along with a pre-wired light outlet. With a steel frame making up the body, the Laguna band saw is one of the best tools on case iron wheels. Among all of the available 14-inch band saws, Jet’s JWBS-14DXPRO 14-Inch Deluxe Pro Band Saw Kit is one of the best on the market. Highly rated, the tool has a 12-inch resaw capacity, which makes it perfect for larger wood pieces. 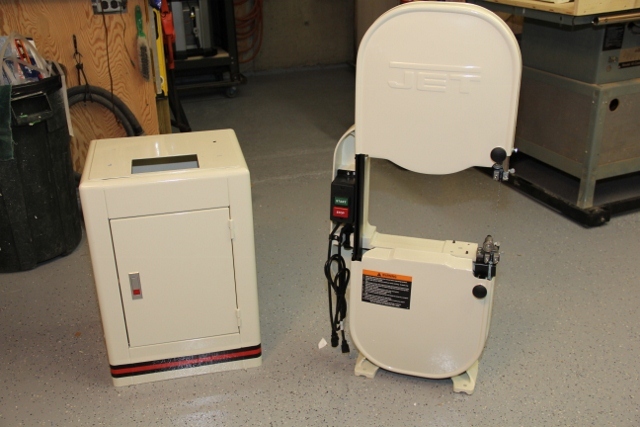 In addition, Jet’s 2-speed ploy-v drive belt system means that it’s a good portable band saw. With such power in such a resourceful frame, the kit is the sports car of the band saw world. Its firmness and force come from the lower and upper iron case frames, and the blade-tracking window creates an elegant range of view. In addition, the integrated blade post allows for pinion and rack adjustments—two elements that make the Jet band saw ideal for most workshops. 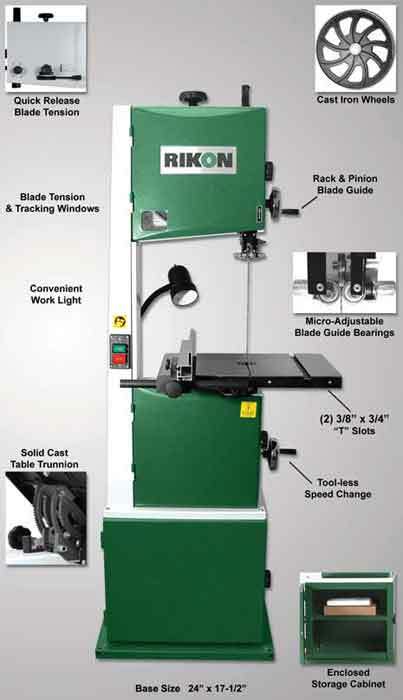 Known for a massive selection of power tools, Rikon has developed the 10-325 14-inch Delux Band Saw. With a quick-release blade tension, two speeds, a hinged blade guard and massive 16 x 21 inch table, the Rikon 14-inch saw is perfect for most work stations. The quick release blade tension is an attention-grabber for two reasons: safety and efficiency. By making sure that the blades are always in their proper place, the Rikon band saw stands firm against wood stock or metal. With full capability, the Rikon works at 1445 feet per minute speed and 2950 feet per minute speed. Finally, there is also a hinged blade guard within the saw that creates a sight window to guarantee proper visibility when working with the device. With the line of sight and adequate worktable, the Rikon is near perfect, since it also includes a 4-inch dustpan within the partition to help keep the saw tidy. For the woodworker with a great deal of work on his plate, the Grizzly 14-inch G0457 Deluxe Band Saw is the ultimate tool. Another unconventional looking piece, the Grizzly is a heavy-duty band saw with a stand that supports heavier saws but can also work on lighter projects. A conventional upper and lower guide comes with the saw in additional to ball bearings that create additional power for the perfectionist. Within the body of the device, the model is made up of an all ball-bearing gut in addition to a 3/8-inch blade that can pass through nearly any wooden or metallic surface. With a hefty shipping weight of over 200 pounds, the Grizzly features a table that is a little over 19 x 14 inches and also features a 2 horsepower 110V/220V single-phase TEFC capacitor. Many band saws come with a fence, which can be used for resawing, along with a miter gauge to use with crosscuts. Since band saws do not usually vibrate, they are sturdier than other types of saws so fewer errors occur. In fact, many band saws allow for personal updates, so after-market additions are welcome. Some models range from 10 to 24 inches, which can be measured from the base to the neck. The depth of the model is also a factor as it can be important for deeper cuts of wood. Within these dimensions, consider what type of work you will be using the device in order to see what is best for you. You should be aware of the features that you should look for before purchasing a value for money band saw. The performance, durability and cost factors should be scrutinized. The blade should be used as per the instructions given by the manufacturer. If the blade is used as per the intended design, it will deliver great performance. In this process you should understand the blade impact properly. The materials used for the cutting process, blade characteristics, blade properties, tooth type, blade pitch and tooth stripping are some of the prominent features which decide the selection of the top rated band saw for the money. As you go through product reviews, you will be able to settle for the top rated band saw for the money without any issues. if you have the necessary skills to manage the band saw, the unit can be operated in an effortless manner. there are some bands which will facilitate you to make various kinds of cuts. The same band saw can be used to cut metals as well as wooden pieces. If you can read information about chips, you can understand the capability of the blade and the equipment. Your ability to identify the issues that are raised with the unit will help you settle for the best product without any issues. It is hard to decide about the band saw to fulfill your business needs. band saw is widely used in various construction projects. Very hard construction materials can be cut easily with the band saw as it will have sharp metal teeth. The selection of the saw should be done as per the specific task that you would like to accomplish. There are different kinds of band saws which include bench top, stand mounted, floor standing. The frame, wheels, hub bearing, and tension system should be observed and you should be able to use the band saw very easily. The above factors will influence your decision in the purchase of the most appropriate band saw for your needs. The 14-inch Grizzly G0457 deluxe bandsaw can perform wide range of operations in an effortless manner. The blade size is 106 inches in length. The blade speed is 3000 FPM. The cutting capacity is 13.5 inches. The unit has 2 HP powerful motor. With an RPM of 1725, the unit delivers excellent performance. The weight of the item is 301 pounds. The durability of the saw is very high. It can be used to perform various kinds of operations in an effortless manner. This is an excellent value for money product. Rikon 14 inch band saw comes with quick release blade tension. There are two speeds associated with the saw. They are 1445 and 2950 ft per minute. The unit has a hinged blade guard with sight window. It has a large table of size 16 x 21.5 inch. The 4” dust port facilitates the removal of waste very easily. You can take advantage of the safe operation of the band saw with blade tracking and tension windows. you can change the blade very easily. 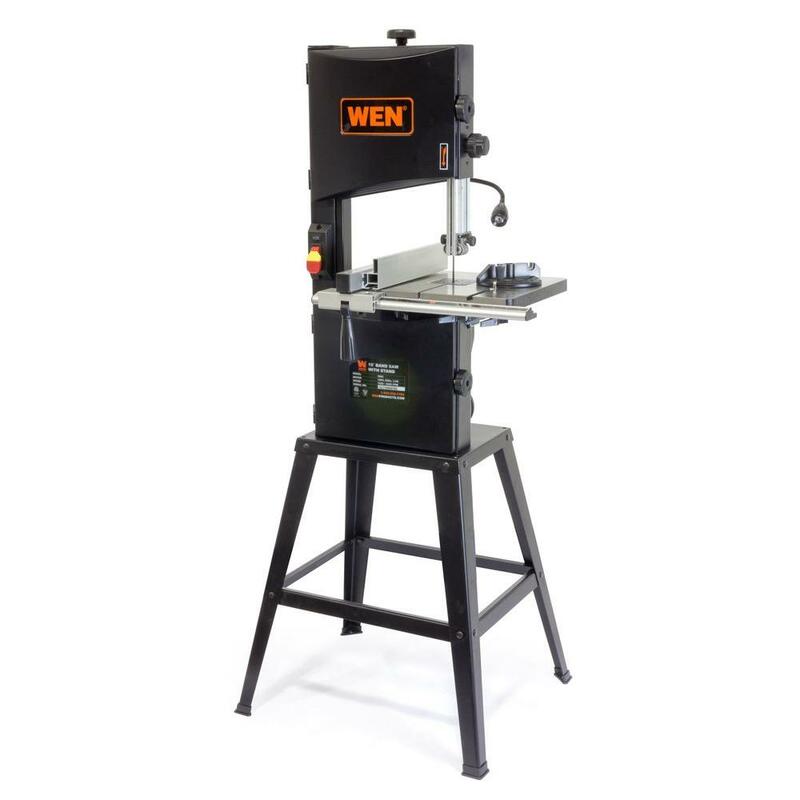 The wood working band saw comes with enclosed stand. The cutting capacity of the band saw is 6” x 13.5”. The blade will move at 3,000 strokes per minute and it is fitted with 1 HP engine. the unit has saw, table and dust chute. The weight of the unit is 185 pounds. You can take advantage of the 15” x 15” table. The unit comes with 5-year warranty. There are powerful features with the band saw. It has very simple and straight forward design. The unit comes with easy-to-follow instructions. As the rip fence is very solid, there will be great comfort in handling the unit. You can expect very high level of fit and finish from the unit. The saw is free from friction and vibration. Rikon 10-325 14-Inch Deluxe Band Saw is the best band-saw from this review. The band saw should deliver very smooth performance and it should be durable as well. The lumbar sizing can be done very easily. You can enjoy uniform operation of the blade with the help of 1.5 HP motor. Wide ranges of applications are delivered by two speeds facilitated by the unit. If you follow the guidelines present in the manual you can operate the band saw in the best possible way. The heavy duty and adjustable rip fence and quick release blades will let you make the most of your time and effort and well. The work area will be very clean as the dust port will let you maintain very high standards. The dust will be out of air. The selection of the band saw should be done as per the functionality, budget and user-friendly features. You should also find the warranty and support offered by the manufacturer. If you have access to spare parts, there will be great value for the money. A band saw is basically saw with long and sharp blade to cut material. These are mostly used in Metalworking, Woodworking and lumbering but they can cut many types of materials. The reason why Band Saw is so useful is that band saw has the ability to provide a uniform cutting as well as curved cutting like a Jigsaw. The Blade of band saw comes in a number of different sizes and tooth pitches which makes the machine highly versatile and gives it the ability to cut a wide variety of Materials like Metal ,Plastic and Wood. Tooth Pitch of a Blade is defined by Teeth per inch (or TPI). Bandsaw is usually powered by electric Motors nowadays and Line Shaft versions have become Antiques. If you are going to buy a Band saw then there are many parameters that you need to know which will help you to buy the top rated Band Saw available in the market as per your need. Today we are going to tell you how to choose the top budget bandsaw and you are going to like it. This is one of the best with Two speed variations of 1520 and 1620 feet per minute for cutting various materials. It comes with a solid 2 year warranty. This bandsaw uses 72 inch blades from 1/8 to 1/2 inch in size for both powerful and intricate cuts. The work table measures 14×12-1/2 inches in size which can be swiveled up to 45. Ball Bearings gives the wheels a smooth operation and a very long life. This is the top band saw under 500 for irregular shape cutting and ripping lumber into thin pieces. Novice woodworkers will find this band saw necessary for their workshop. Its Articulating LED Light illuminates Cut-line and makes sure that you can easily visualize it. To minimize dust in the work space, dust port is also provided to attach the vacuum hose. 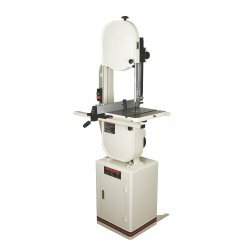 This Band saw provides features of a Full Size bandsaw in a Bench Top Model at an affordable Price. This Bandsaw now also includes Rip Fence which can be easily removed to do free Handwork. This Bandsaw comes with 1/2 Horsepower. It is the most affordable bandsaw with quality features. Blade Size: 62 inches × 1/8 inch × 3/8 inch. Added Versatility for resawing and scroll cutting. Choosing the Material of Blade which will easily cut the material you want to cut. Anything in between 0.5-0.75 is good for basic cuttings like resetting edges, Craftwork, creating veneers etc. If you are going to work on hard wood then its good to invest in a Machine with at least 1 horsepower. More Important things that you must consider while buying a Band saw. A benchtop or tabletop band saw is a cutting tool, used for cutting various objects made from wood, metal, glass and other materials. It is a very essential tool that offers perfect cutting for manufacturing wooden structures like furnitures, showpieces and metal products. There is a wide range of tabletop band saws and that’s why finding a great table top bandsaw is a tough task. Here we are suggesting some essential tips, which you should follow to find the best tool. These tips will lead you towards a perfect tool, which you can immediately order online. Band saw vs table saw, what do you actually need? This point is quite essential because the maximum people make mistake of considering both band saw and table saw the same tool. Actually, both are different and their cutting jobs are different. The band saw is used by those, who are passionate about crafting wood into artistic and charming wooden products like decorative wood veneer, wooden sculptures, stylish furniture and decorative wooden boxes. The table saw is used by professionals like carpenters to prepare home furniture like chairs, shelves and other things. So, now decide that band saw vs table saw, what you need. Just like the band saw, table top bandsaw also has several types. You can buy a Portable Table Saw, which you can haul to different locations according to your requirements. The Contractor Saw is also portable, but not light enough to haul easily. It is perfect for the professionals, who work on different job sites. There are also Cabinet Saws and Hybrid Saws, which have different sizes, different features and different work specifications. Carefully check the type of work each saw provides and then pick a right cutting tool. If you are not a professional and want the benchtop bandsaw for occasional cutting jobs, then cabinet saw would be perfect for you. It will offer excellent cutting experience and quality work, if you use it once or twice in a week. The contractor saw is not for the professionals, but still professional people can invest in the high-class model of this type’s tabletop saw. In case, you are a professional and you want a machine to operate frequently for cutting and crafting wood, then hybrid saw is perfect for you. It is the best cutting tool for small furniture shops. You can use it the whole week and there will be no technical or quality issue, when you will use the hybrid saws. There is no need to say that any saw can offer top-quality cutting job, if it uses top quality components. In case of table band saw also you should check that which brand offer durable fence system, trunnions, the mass and stance, top quality grind and finish, and the extension wings. Follow these tips, check every component and ensure the durability of the machine and you will get the best bench top bandsaw for your work. A wide range of cutting tools is used by woodworkers to cut and rip objects. Big wood cutting machines are installed in the industries, where wood cutting work is done on the large scale. Small shops don’t need such a large tool because operating and maintaining it would be a really expensive task for them. They need a more economical and power efficient options like a small band saw or table saw to complete their works. Yes, small size’s cutting tools can be available and you can find the best tool by following below given suggestions. What should be the size of the tool? The size can vary according to the requirements of the user. The experts recognize the size of the band saw by considering the diameter of its wheels. Its width can be around 1” and the height between the work table and starting edge of the blade can vary. You can find 14” to 20” work space, by depending upon the size of the band saw. Portable or hand held band saw offers much smaller cutting space, but these tools are quite handy for portable cutting work. So, consider the work space and the size of the wheel carefully, before you place the order. A small band saw, equipped with high-quality cast iron wheels, is probably the best choice for small scale’s wood cutting or metal cutting works. It produces a robust flywheel effect to provide perfection in the cutting work. The wheels should use flat tires to move the steel blades of the cutting machine. Flat tires offer smooth and high-quality rotation that improves the performance of the cutting tool. 1” wheel tires would be the best for cutting and resawing work. The guidepost is an essential component of band saws, which guide the blade towards work space. It maintains the position of the blade and directs it towards the cutting space and keeps it stable to prevent injuries and poor quality cutting. The guidepost should be adjustable so that you can cut various sizes’ objects. 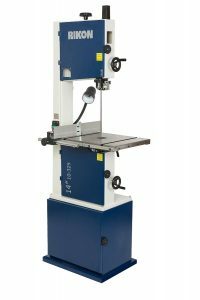 Modern small size’s band saws offer adjustable guidepost to accommodate different thickness’s cutting objects. It should be easily adjustable and durable enough to hold the position of the blade on a certain point for a long time. Top-class cutting tools are equipped with high-quality guidepost, so invest your bucks in a top quality band saw cutting machine. 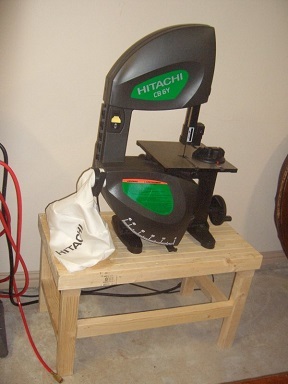 Do not worry about the table size because 16”x20” table size’s band saw would be a great choice for small woodworkers. Of course, a hand held band saw would not comprise the table, but you can operate it by holding it in your hands. The band saw should comprise fence with adjustable mechanism to provide support for cutting different size’s objects. Along with above given components, you should also check the blade size band saw blade and other components of the cutting tool to ensure that you are investing in a high-quality cutting machine. What is a band saw ? All band saws share a common characteristic with jigsaws, a thin blade. A band saw can cut smaller pieces than a jigsaw. This type of saw allows you to see your work better than a jigsaw, so you can make cuts faster. 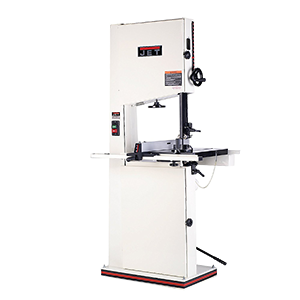 Introducing a band saw to your shop will add many different cutting capabilities. Another big advantage of a band saw over a jigsaw is the ability to stack cut. Band saws are better suited for cutting thicker materials because the blade does not wonder. The innovative design of the band saw provided more accuracy than a circular saw, while using less power to operate. By using a long ribbon saw blade, the heat created is dramatically reduced. This is because only a small portion of the blade is being used at a given time. The cutting blades long looped design is perfectly suited for this type of use. The downward force of the blade hitting your wood helps to hold your wood snug to your saw table. This improves the overall accuracy of your cuts and reduces the amount of sawdust created. When WWII broke out, certain tools and products became increasingly difficult to obtain due to price or scarcity. This led many craftsmen of that time to build their own, by using directions printed in Popular Mechanics magazines. These became very popular and homemade furniture began to become a normal site again. Today, the band saw is a staple of the woodworker’s community, with a variety of different styles and configurations available. The overall craftsmanship of any potential band saws should also be reviewed, with special attention paid to the length and terms of the products warranty. You should also consider how much continues use time you will require. Will you be sawing for a hobby or for a profession? What is your budget? Home workshops will benefit the most from a table band saws capability. When operated correctly, a good band saw can easily cut through wood and metal with little to no loss of accuracy. A table band saw provides you with a stable platform to cut on. This type of saw allows you to cut pieces at angles, such as beveled cuts. Make intricate cuts with precision, and raise your craftsmanship to the next level by understanding how to use your table saw. Band saws can come in many variations to fit your workspace. If you are cutting pipe in an area with reduced visibility, you should consider a band saw with an internal light. This will improve your low light visibility and accuracy. A wireless unit is going to give you more flexibility, but you are going to want to bring your backup batteries to ensure you don’t run out of power. A band saw should feel smooth when cutting. This smoothness is attained by using ball-bearing stabilizers, located around the axles of the saw wheels. These wheels can come in two configurations, V-belt pulley, and solid steel. These can come in many different sizes. Larger wheels will provide a smoother cut with 1″ being one of the most popular sizes on the market. The main thing to understand about band saw wheels is, they must be true round. If your band saw wheels are not balanced, this will cause harmonic vibrations to occur. Harmonic vibrations are the worst thing for band saws. They will cause unnecessary wear and inaccuracy. Blade tracking can decrease harmonic vibrations, significantly. Band saws come in two variations, a 2-wheel, and a 3-wheel configuration. Depending on your workload, you may find one better suited for the job. A 3-wheel band saw gives added throat but has some disadvantages. The throat is the distance between the down cutting side and the return blade. A 2-wheel configuration is preferred in most scenarios. This is because there are less directional changes resulting in less blade wear. Below are some other subcategories of band saws. These large saws are used to make the first cuts into a log. This type of band saw has a wider tooth spacing and silver teeth on the reverse side of the blade. The silver teeth are used to clear debris from the cut. This type of saw is very similar to a head saw design but much smaller band saw. This saw is usually found in home workshops. This is the perfect saw for the hobbyist. This type of band saw is designed to cut along the grain of timber to split it into veneers. Resaws use a wide blade to reduce the waste produced. This type of band saw is very large. Double cut band saws have blades on both sides for cutting while removing from deep cuts. This type of band saw is used to cut metals and comes in vertical or horizontal arrangements. The vertical band saw is called a contour saw. It is common for this design to have brushes to prevent residue from getting into the wheels. Before you buy any band saw, you should consider the amount of use you predict. 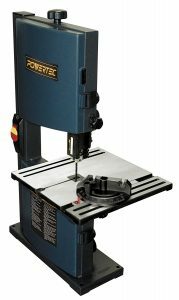 You don’t want to buy a band saw that is designed for a hobbyist if you plan on commercial usage. You also don’t need to spend the same amount of cash on a hobbyist band saw, as you would on a professional saw. If you are purchasing a used band saw, you should change the blades prior to use. 3TPI blades, in extra-set, are great are great for woodturning. They can produce excellent results. You should always try to get at least a 1-hp motor. This ensures your cutting power is adequate to complete your projects. A 6” cutting height should be your minimal requirement. Inspect all guides and rollers to make sure they are firm. Consider the manufacturer’s warranty length and the quality of the brand. Not all band saws are created equal; many have subpar craftsmanship that causes reduced durability. Avoid this by sticking with well-known manufacturers, most of whom provide 1-year plus warranties. There are so many varieties of band saws available on the market today. With so many choices, it can seem overwhelming to choose the right one. This versatile machine has been a vital part of woodworking for over a century. Prior to its invention, the majority of detailed woodcraft required handmade tools. Today, we can all benefit from the intelligent design of this product. 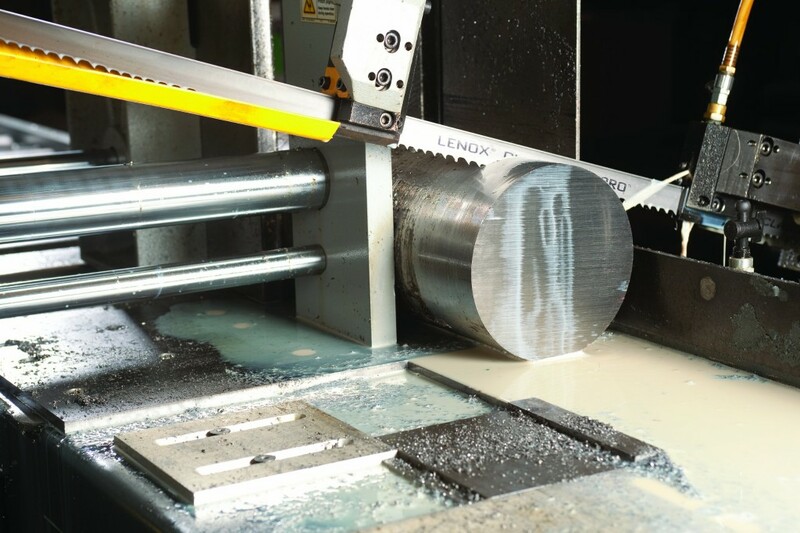 Technology continues to shape band saws by adding new features. Safety has become a primary concern of manufacturers, who are eager to prove their product is the best value. A well-maintained band saw can last a lifetime. By doing your homework, you can find the perfect band saw for your use. Use this 2016 band saw buying guide to help you make an informed decision. Quality is going to be the main determining factor when considering the choice. Understanding the proper use of a band saw is the first step on your journey to finding the right band saw for you. There a couple setting you must have set up in order to use the band saw. First, before setting up anything on your band saw you should unplug it. This will prevent accidental turn on and shocks. Next, you need to tune your saw. If not properly tuned, your band saw will cut more like a chainsaw, and if your blade is drifting, your cuts will not be as accurate. Your guide bearings must also be set to control side-to-side movement of the blade. Next, you should consider what type of cut you are making. Then, what type of blade is required. Blades come in all different thicknesses and tooth counts. The fewer teeth you have per square inch the coarser your cuts will be, but the faster it will cut. A smooth cut will require more teeth per square inch. The number of teeth on your blade will influence your feed rate. Then, consider your cut radius. A curved cut will require a thinner blade. The thinner the blade the sharper the curve you can create. This is opposed to resawing that requires a wide blade, usually close to 1″ in thickness. Before installing your blade, you want to make sure your throat plate has been removed and your guide has been taken completely off. Also, make sure your table pin is removed. The tension should be backed off, so the wheels are closer together. Safety glasses should always be worn when working with band saws. Before installing your blades, clean the wheels with a small piece of 220-grit sandpaper. Now place your blade around the lower wheel first. Then, place the blade around the top wheel and center it between the guides. Once installed you must center and track the blade. Do this by adding tension to the blade to pull it taught. Once you have tension start turning the top blade wheel by hand. Now, turn the tracking knob to turn the center of the wheel. Do this until it is centered. You must have proper blade tension to operate your band saw correctly. This is done by adjusting your tension to one size larger than the blade installed. For example, if you have a 1/2″ blade, you would take your blade tension to the 3/4″ setting. You should always take the time to fine-tune your blade tension. It is important to back this tension off when the saw is not in use. If you keep the tension on, it will compress the tires on the wheels and cause premature wear and tear. If you operate the saw with not enough tension, your cuts will be inaccurate. Once your tracking and tension are correct you are ready to adjust your blade guides. The upper guide consists of a thrust bearing that turns to provide support. There are also side guides to prevent the blade from sway. These should be set to the width of a card from the blade, almost touching it. The lower guide should be set up the same way, keeping the width to that of a card. A business card can be used to get you as close as possible to the blade without any crossover. One of the main things to adjust prior to making any cuts is the blade guard height. This moves up and down to expose only the cutting part of the blade reducing vibrations. This guard should be set 1/4″ above the surface of your cutting area. If this is not properly set up, you will lose accuracy during your cut. Rotate the wheels by hand and check for any blade obstructions. If everything is still smooth, plug your band saw in and turn it on. Check to make sure nothing is binding. Now, unplug the saw and raise the guard. Take a square and check your square to blade. This will ensure your cut is square to the table. You don’t want to cut from an uneven table unless your plans call for such an action. Blade drift is the natural tendency for blades to angle. Adjusting the fence can correct this. The fence is the adjustable wall on the table. Once these items are set up, you are ready to start sawing. When you start your cut, you don’t want to be making contact with the saw, until the blade is on. Once the blade is on, you want to begin slowly moving your wood into the blade, steering it from behind. When cutting, you can feel the cut rate your saw blade requires to operate properly. This is called your feed-rate. This should feel smooth and even. It may be necessary for you to adjust your speed to get the best feed-rate possible.